WOW! 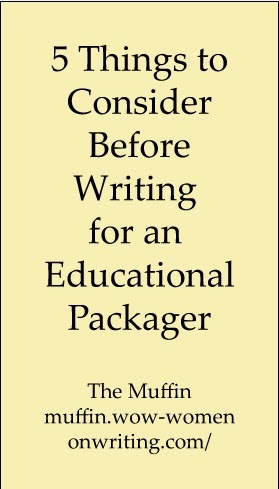 Women On Writing Blog: Writing for Educational Packagers: Is It for You? Sue--I bow down to you. You are one fierce writer. Thanks for posting the "requirements" needed to do this kind of job. Many will consider, few will apply (I imagine). Part of it is being at the right point in your writing career. I've had a lot of experience in research and I have almost as much experience writing nonfiction. Plus, I had space in my calendar. That said, it definitely isn't for everyone. You'd be excellent at it although you might want to wait until Katie is a little older. Shrug. I don't know how you work.